A delegation from the Heavenly Culture, World Peace, Restoration of Light (HWPL) initiative based in South Korea recently visited the Middle East and Africa. While the whole world calls for peace and reconciliation in the Middle East region, the delegation led by Mr. Jae Seob Jee, Executive Director of HWPL, carried out a 30-day peace journey which began on April 27 2015. During the journey, they visited several Middle Eastern and African countries including Israel, Lebanon, Jordan, Ethiopia, Egypt, Bahrain, Qatar, UAE and Kuwait. The representatives attended an array of diverse events from youth peace walk festivals and gender equality conferences, to interviews with corporate broadcasting representatives of each country. 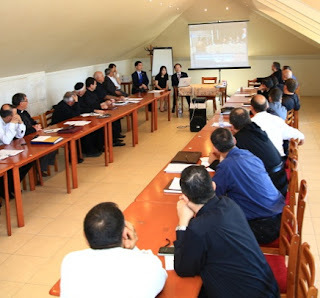 Lebanon- On May 9th, the delegates were invited to a meeting of 30 religious leaders with the Eparchy of Sidon. Participants were introduced to the work of HWPL by watching the highlights video of the last WARP Summit and listened to the message of Mr. Man Hee Lee on the importance of religious leaders in establishing peace. Afterwards, they all promised their active collaboration with HWPL. ◀ Meeting with 30 religious leaders in Sidon.